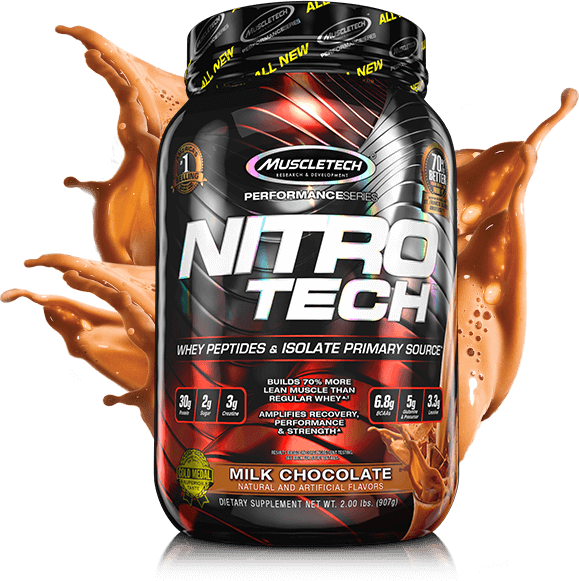 NITRO-TECH® is a scientifically engineered whey protein formula, and is enhanced with the most studied form of creatine for even better gains in muscle and strength. It also features whey protein, which is the most popular type of protein. Whey protein is made up of branched chain amino acids (BCAAs) and essential amino acids (EAAs), and has the highest biological value (the measure of how well your body absorbs and assimilates protein). 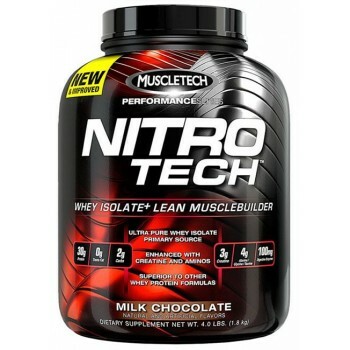 The whey protein in NITRO-TECH is sourced primarily from whey peptides and whey isolate – two of the cleanest and purest protein sources available. Using these proteins on a daily basis is vital in helping to increase muscle protein synthesis for more muscle size and strength. NITRO-TECH® is designed for all athletes who are looking for more muscle, more strength and better performance. Mix 1 serving (1 scoop) in 6 oz. or 2 servings (2 scoops) in 12 oz. of cold water or skim milk in a glass or shaker cup. Simply put the liquid in the shaker first, then add a scoop of NITRO-TECH®. Place the lid on the shaker cup and shake until blended. Try stacking NITRO-TECH® with your favorite pre-workout and musclebuilding supplements. VaporX5™ Next Gen and Clear Muscle®are two great supplements that can help create the perfect stack for real results! Isolate Protein & Peptide Blend (Whey Protein Isolate, Whey Peptides, Whey Protein Isolate 97%), Whey Protein Concentrate , Cocoa (Processed With Alkali), Chocolate Cookie Crumbs (Rice Flour, Sugar, Cocoa (Processed With Alkali), Tapioca Starch, Palm Oil, Corn Starch, Natural Flavors, Salt, Sodium Bicarbonate, Soy Lecithin), Natural And Artificial Flavors, Soy or Sunflower Lecithin, Gum Blend (Cellulose , Xanthan, Carrageenan), Enzyplex (Papain, Amylase), Salt, Silicon Dioxide, Sucralose, Acesulfame-Potassium. Contains Milk And Soy Ingredients. Processed In A Facility That Also Processes Egg, Wheat, Tree Nut, Peanut, Fish and Shellfish Ingredients.